Love Hallmark Movies? On this page, rediscover the twelve Christmas-themed Hallmark movies that were released in 2012 and find out where you can buy them. Christmas Song originally aired on November 3, 2012. It starred Natasha Henstridge and Gabriel Hogan star in a story about two schools that have been merged into one. The rivalry of the former two schools dies hard, especially for the choir groups and the music teachers from the two schools who are forced to compete for the single teaching position with the competition taking the form of a Christmas song competition. A Bride for Christmas originally aired on December 1, 2012. It shares the story of a young woman who cancels her third engagement as she stands at the altar and is determined not to have another serious relationship until she meets the right man. She meets a young man who unknown to her is trying to win a bet that he can convince a woman to marry him by this Christmas. Baby's First Christmas originally aired on December 15, 2012. It features two lawyers - one male and one female - who are so different that they simply cannot get along. Finally, one of them moves on to another location but the pair still finds themselves thrown together when their sister and brother fall in love and have a baby. However, the baby's parents are in a difficult situation and the lawyers are forced to step in and help out. 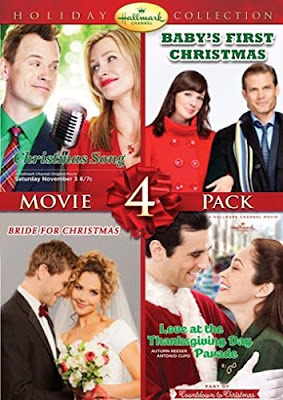 Christmas Song, A Bride for Christmas and Baby's First Christmas are available on DVD as part of a four-movie set, as shown above. Movie collections like this are almost always more economical to buy than single DVD releases plus, in this case, you get four great Hallmark movies to watch. You can find it on Amazon by clicking right here. 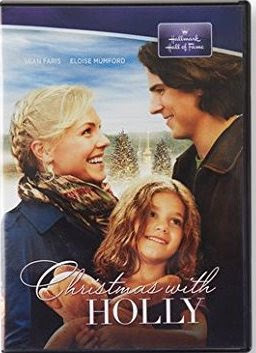 Originally appearing on December 9, 2012, Christmas with Holly is a Hallmark Hall of Fame movie presentation, which means that it aired on ABC instead of the Hallmark Channel. That is particularly important for those many Hallmark movie fans who do not have access to the Hallmark Channel.You can watch the official movie trailer and learn more about Christmas with Holly by clicking right here or you can buy the DVD from Amazon by clicking here. Matchmaker Santa originally aired on November 17, 2012, and stars Lacey Chabert, Florence Henderson, John Ratzenberger, Adam Mayfield and Donovan Scott. It tells the story of a woman in love with a workaholic named Justin who winds up stranded with his assistant, Dean, in a small romantic town at Christmas time. Matchmaker Santa is not available on DVD. Hitched for the Holidays originally aired on November 25, 2012, and tells the story of two young people who look for a temporary partner in an effort to please their families during the holidays. They do find each other but things become complicated when the Catholic and Jewish families get involved. It stars Joey Lawrence, Emily Hampshire and Marilu Henner. Buy Hitched for the Holidays on DVD from Amazon. The Christmas Heart originally aired on December 2, 2012. It sees traditions change on Arthur Avenue when a teenager from the neighborhood is hospitalized because he needs a heart transplant. A heart is located but must make it to the teenager on Christmas Eve through a snowstorm. The neighborhood puts out luminaires to honor the young man and his family and those very lights help save Matt's life. The Christmas Heart is not available on DVD. Originally airing on December 8, 2012, Come Dance With Me shares the story of a financial executive trying to make a good impression on the head of the firm because he wants a promotion. However, at the same time, he is dating the daughter of the man he is trying to impress and the young lady's mother doesn't approve of the match. In an effort to create the perfect proposal, the young man signs up for dance lessons but once he starts dance lessons he discovers feelings for the dance instructor. Click here to buy Come Dance with Me from Amazon. Help For The Holidays premièred December 9, 2012, and tells the story of one of Santa's female elves who wonders if life offers more than just making toys for Santa. When Santa receives a special wish from a youngster in L.A., he sends Christine to visit the family. The family, it turns out, needs an intervention because mom and dad are too busy working and the children often left alone. Christine takes on the roll of nanny, hoping to help bring the family back together. Help for the Holidays is not available on DVD. It's Christmas, Carol originally aired on November 18, 2012. It captured my interest immediately because it is a twist on the traditional story, A Christmas Carol. 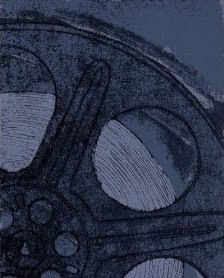 In this version of this movie, a successful and ruthless book publisher is visited by the ghost of a previous boss who visits the past, present and future revealing how her ways have been bad. Of course, she will wake up ready to repair her nasty past. It's Christmas, Carol stars Carrie Fisher, Emmanuelle Vaugier and Carson Kressley. Naughty or Nice originally aired on November 24, 2012. It tells the story of Krissy Kringle who doesn't feel like dealing with the Santa mail she receives because she lives on Candy Cane Lane. However, she receives a parcel that she can't ignore that contains Santa's Naughty or Nice book. Naughty or Nice stars Hilarie Burton, Matt Dallas, Meredith Baster and Michael Gross. The Wishing Tree premiered on November 10, 2012. It stars Jason Gedrick, Emmalyn Estrada, Richard Harmon and Amital Marmorstein, The Wishing Tree shares the story of a professor who struggles to put the past behind him. He winds up helping a troubled teen turn her life around through a Christmas tree that is decorated with handwritten wishes and of course, the tree helps us all believe that wishes really do come true. It's Christmas Carol, Naughty or Nice and The Wishing Tree are available on DVD as part of a four-movie set, as shown above. You can find it on Amazon by clicking right here. Well that's it. The Hallmark Christmas movie list from 2012. Which ones did you see? Which ones did you miss? Which one is the most intriguing to you? Be sure to take a moment to say hello in the comments box shown below. Check out all of the Hallmark Christmas-themed movies on Amazon. Follow HALLMARK MOVIES movies on Pinterest. So many wonderful Hallmark movies!!! I mostly love them all! Would be great to see Matchmaker Santa one day on DVD and many other Hallmark movies, too! Thanks so much for visiting and commenting. There are so many great Christmas films, it is hard to pick.